Maximize your Firebird+ vst with the new 'Wireless 2' soundset. 100 speaker melting new sounds. Picking up where 'Wireless' left off, and taking things up a notch. Wireless 2 is good for use in the following genres - Industrial, Glitch, Dubstep, Metal, Trap, Complextro and any other genres that call for sometimes heavy and often times distorted and energetic or memorable sounds. 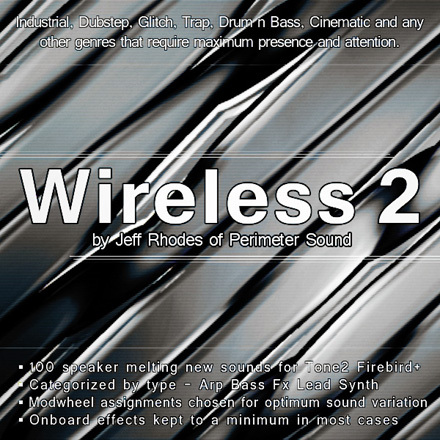 Wireless 2 is a new collection of 100 Tone 2 Firebird+ synth patches : they were made while I was working on 2 soon to be released new loop sample collection series. You can check those out soon from Zero G. Meanwhile, please give a listen to the brand new demo track for the set : made by Jarosław Janota aka - SuperNoise. Please note that the demo mp3 contains beat loops found in the Perimeter Sound Bio-Mechanic Beats II loop sample set. Grab the freebee pack and check out 12 patches totally free, no strings attached, no *demo* rules, just a gift to try-before-you-buy. The full set comes in a single .fxb file, so you can just load it up and have all the patches ready to go, as well as seperate .fxp files in case you prefer working with sounds that way.